Then ImTOO iPhone Transfer Plus is the solution of your iPhone media management. Transfer files between your computer, iPhone and iTunes. With the ImTOO iPhone Transfer Plus can you transfer videos, music, ebooks, contacts, messages, apps and photos from your iPhone to computer and vice versa, plus convert and transfer nearly all video/audio files and DVD movies to iPhone in a single step. You can even backup files from your iPhone directly to iTunes. Transferring and managing your iPhone files couldn't be simpler! ImTOO iPhone Transfer Plus supports all iPhone/iPad/iPod models including iPad, iPad mini, iPad Air, iPad Pro, iPod, nano, iPod mini, iPod shuffle, iPod classic, iPod touch, iPhone, iPhone 3G, iPhone 3GS, iPhone 4, iPhone 5S, iPhone 5C, iPhone 6, iPhone 6 Plus, iPhone 6S, iPhone 6S Plus. In addition, with ImTOO iPhone Transfer Plus installed in your PC, you can manage files on your iPhone like a removable hard disk in Windows Explorer. Transferring and managing your iPhone files couldn't be simpler! Download ImTOO iPhone Transfer Plus now for FREE! Transfer and backup iPhone music, videos, movies, photos, ebooks, contacts, messages and apps to PC; backup iPhone content to iTunes library (iTunes 12 supported).Photos and videos recorded by the device are also supported. Copy photos from photostream to PC, import contacts from incredimail. Transfer music, videos, movies, photos, ebooks, contacts, messages and apps from PC to iPhone. Work like a DVD to iPhone transfer – convert and transfer DVD movies to iPhone in a single step. Convert and copy video/audio files in almost any format to iPhone. ImTOO iPhone Transfer Plus fully supports iOS 11 and iTunes 12. Support all iPad/iPhone/iPod models: iPad, iPad 2, iPad 3, iPad 4, iPad mini, iPad mini 2, iPad mini 3, iPad mini 4, iPad Air, iPad Air 2, iPad Pro (12.9/9.7/10.5 inch), iPod, nano (5th Gen), iPod mini, iPod shuffle, iPod classic, iPod touch, iPod touch 4, iPod touch 5, iPod touch 6, iPhone, iPhone 3G/3GS, iPhone 4, iPhone 5/5S/5C/SE, iPhone 6/6 Plus, iPhone 6S/6S Plus, iPhone 7/7 Plus, iPhone 8/8 Plus, iPhone X, iPhone XS, iPhone XS Max, iPhone XR. Connect multiple iOS devices at one time and transfer files between them by drag-and drop. 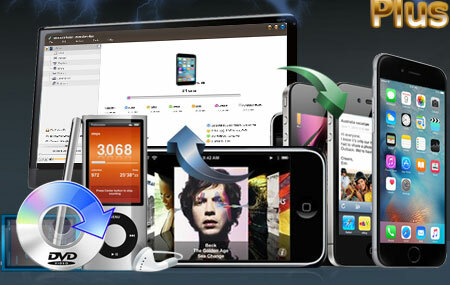 Drag and drop applications between PC and iPhone, also support to manage application document. Import and export contacts for iPhone and other Apple devices like iPad, iPod. Manage iPhone as a portable hard disk. Transfer, edit and manage iPhone ringtones and eBooks in PDF or EPUB format easily. Customize column to show file details and edit the ID3 tag info for multiple files simultaneously such as name, artist, album, and year. Play and preview iPhone videos/music and DVD movies with the built-in resizable media player. High-speed file transfer from computer to iPhone, iPhone to computer and iPhone to iTunes. Find music, videos and photos as easily as iTunes with Filter and Quick Search. Create and edit your own playlists to manage and classify your music, videos and photos. 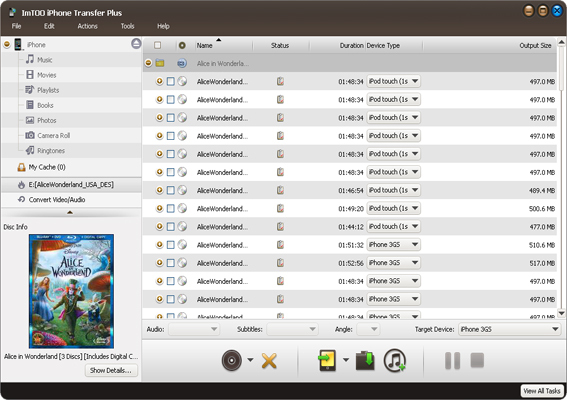 View files in multiple 2 different modes: songs, albums, artists and genres, thumbnail and list. Add your own picture as the artwork in thumbnail mode. Multilingual interface: English, French, Italian, Japanese, Spanish, German, and Chinese. Fully compatible with iOS 6.1, and iPhone 5, iPod touch 5, iPod nano 7, iPad Air. Tips: How to sync iPhone to new computer? Convert and copy Video, home DVD, and Audio for iPhone.